Thank you all for being willing to get engaged in a discussion about the role of the union in education reform. For a long time we felt like we were all alone in the “big hall” talking about the need for unions to change and to get engaged more deeply in education reform. But a growing number of people have shown interest in this, so these days Adam Urbanski and I find ourselves on the road a lot, having conversations about what could be possible. What is new unionism, and what is the role of the union? What is the role of management? What are the roles of parents and other interested parties in trying to make our schools work much better for our youngsters? Our mission statement, basically, boiled down says, “If it’s going to be good for the children, it’s going to be good for union members”. This is quite a change from years gone by where unions were pretty much in the industrial mode and followed the industrial model, taking care of themselves without having an equal interest in youngsters who were going through the schools. The old industrial model was great for a while and it brought some legitimacy to teachers and some middle-class living values into union members’ lives and made it possible for union members to send their kids on to college and some other things. But it really was not providing the kind of leadership and support for changes that needed to take place in our schools. 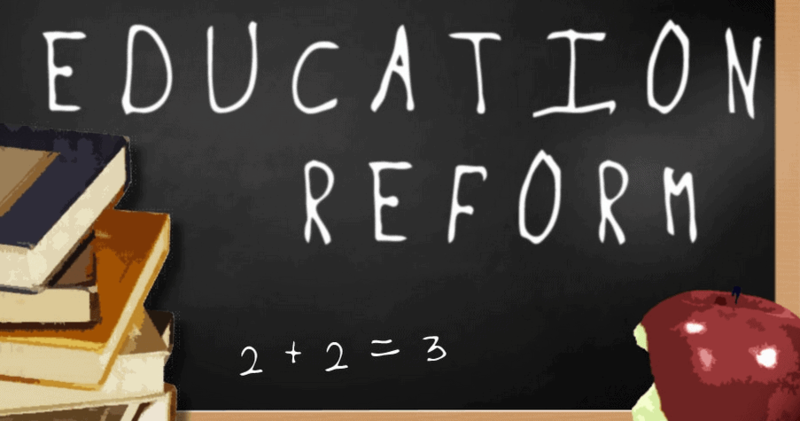 So we’re talking more about re-inventing public education than reforming it, because I think it needs a really good hard shake for it to be successful in terms of meeting the needs of youngsters as described by policymakers and others. The world has changed what it expects from our graduating seniors and so we need to re-think and re-invent the institution so it can deliver around those goals. In addition to my 40 years in education, I’m married and I have six kids and eight grandsons, so I have a continuing interest in making sure public schools function highly effectively. I’m also engaged in a lot of work these days on two projects for the Gates (Microsoft) Foundation. One is trying to transform districts and schools. This is an effort to see whether or not the school district itself can be a change agent for reform, or if we have do it school by school. In a lot of cities across the country, we have what I call random acts of innovation a good school here and a good school there. But they don’t replicate, so there are many schools that are mediocre and some that are poor. This is an attempt to see if we can’t help the district become the change agent and create a system of schools as opposed to a school system, with the emphasis on helping schools become effective units of change, supported across the district. In Seattle, we call this a networked system of schools, because we want to link the schools together to exchange best practices. This was an idea that really came out of our union membership. Through working collaboratively with the superintendent and the school board, we’re pretty much on the way towards making that a reality. The other major work that I do with the Gates Foundation is starting brand-new high schools from scratch small units of 400 kids in very, very difficult environments. We work in big inner cities where the dropout rate for kids is normally 50% 60%. We’re trying to create some new institutions and entities in those cities that will be shining lights for these youngsters and then see if we can replicate that in district high schools. High schools are the main challenge in the States, at least; they are the last to change. For so many years, they were told if schools could be big and comprehensive that would be great, and so people worked very hard at becoming big and comprehensive. Now we’vesaid, “Well, it really isn’t producing the kinds of results we need for kids, so let’s re-think this.” So, the changes there are dramatic and very interesting and challenging. In terms of TURN, we’ve said, “If it’s going to be good for the children, it’ll be good for union members”. Let’s start there. You’ll see my lapel pin says Children First. I started this even before we drafted the TURN statement, but I think more and more unionists have now signed on to the notion that unions really have to concentrate very hard on making sure that we’re creating the kind of educational environment for our students where they will be successful. And if they are successful, union members will also be successful. They’ll feel good about their work, they’ll see the return from their efforts, and this is going to be very energizing. This is where, I think, teachers have been for a long time teachers and administrators, certainly parents and others. We just like to see our kids get a good education. We like to see them meet or exceed the high standards that are set and we’d like to have them find some real satisfaction out of their education experience. We need to find ways to make sure their educational experience is a positive one. And teachers are the main source of making that happen. New unionism is a catchphrase that Bob Chase put together and decided to run with several years ago as president of the NEA. It’s based on a lot of things that Adam was doing in Rochester and we were doing in Seattle. I’m going to describe that today so that you’ll have a better picture of what those specific entities are. You’ll have my context for this new unity and the critical elements that we see in contracts and working environments. When I went to Seattle ten years ago, it was an interesting experience. After travelling the country for years, I decided to go some place where I could stay long enough to see if the work I wanted to do would have any impact. There were a lot of very significant challenges. Enrollment in Seattle was down to 40,000 kids from 90,000, largely due to de-segregation efforts and cheaper housing in the suburban areas, so the city was pretty hollowed out. The student population was about 80% minority, where it had formerly been 80% white. The dropout rate by conservative numbers was 30%, and over 50% for poor students. The public had rejected bonds and levies for several years in a row, which was draining resources out of the school district. There had been two investigations into district management one done by a legislature, that was very damning and accurate. But there wasn’t any motivation from the school board or the community to do anything about those investigative reports. Teachers’ morale was pretty bad and getting worse. Business leaders were just shaking their heads. I did a study to gather data about where the business community and the key supporters in the community were. We discovered that 65% of them had graduated from Seattle public schools. They believed the system was pretty good when they went through and thought what they saw today was pretty bad. And they really didn’t have much hope that it was ever going to turn around. The union was filing 200 grievances a year. Most grievances were about relationships between teachers and administrators, and some were about working conditions. The leadership of the organization was pretty shaky. In fact, the day before I arrived, the president was arrested for inappropriate behaviour with small boys. The superintendent had a seven-member board and he was never sure if he was going to have the fourth vote to keep his position. So, I don’t know if it could get much worse. It was certainly a challenge. Seattle was truly a mess and I say all of that because it’s pretty common to see this kind of decay that had taken place in public education. The union members were saying, “We’ve got to do something here, we cannot continue”I can’t keep doing this day in and day out.” So, we did a lot of listening to the membership, which is another important part of data collection. One of the things we asked them to do was to write one-page describing what an ideal teaching situation would look like for them. What they put on paper gave us a good indication of where they were, why life was not good for them, and why we weren’t doing a very good job with kids. That led to the establishment of a Peer Assistance and Review Program. One of the problems was that administrators were not too eager to put people on plans of assistance. They were afraid that they would be called in to some kind of a court hearing to defend their decision when, in many cases, they hadn’t given any help or assistance. I’m not saying they’re bad, but things had got to the point where everybody did their own thing. Isolation was deep, and the only people who worried about some kind of continuing education were the kids and their parents. It seemed like the teachers were saying, “If I can just shut my door and get through this eventually”” So it was a very lonely environment, not very challenging, and not very professionally-oriented. A Peer Assistance and Review Program was also needed for the new teachers. Some of the graduates we were getting into our school system were without the needed skills and desire to be successful. I don’t blame the kids or the institutions. Everybody thought they were doing what was important and right, but the world had changed so much with the needs of the kids, that things were just not relevant or aligned anymore. So every new teacher goes through this program run by experienced teachers, chosen by both management and labour, and taken out of their classrooms for three years. We pay them a stipend of $5,000, which is more than we pay the Athletic Director because we wanted to send a real signal about how important this was. Our Athletic Directors are always the highest paid in terms of extracurricular stipends, so, this was a shock, prompting a grievance against the union from the Athletic Directors. But we proceeded with gusto and have coached a number of teachers who just couldn’t make the changes to find other careers. None of this could have happened had we not also worked very hard with the administration and the school board to create a climate where they were willing to share some of the responsibility with us for some key activities like the quality of the teaching force. They had been running professional development programs for a number of years that were basically irrelevant. Although people got credits for them and moved up on the salary schedule, the programs really weren’t as relevant as they needed to be to help people. So, this was the first initiative. The business community said, “You mean the union is actually going to chase people off who are not performing effectively?” It was a first major step forward for us in terms of getting some recognition that the union was going to change; that we were going to take some direct responsibilities for this. Before, we said, “We didn’t hire them; you take care of them.” Now, we’re beginning to see some changes. You will find this in most TURN locals today. There are 25 TURN locals, and I think there are only two now that don’t have some kind of Peer Assistance and Peer Review Program. It was a wonderful place to cut into changing unionism, changing how people saw unionism, to be able to say the union’s going to take some shared responsibility with the administration for the quality of the teaching force. We’re going to do that by making sure that people get the help and assistance they need, and if they can’t make it, then we’re going to exit them. At the same time, we are going to run a very enthusiastic, aggressive professional development program, done jointly by the union and management. We found out that management wasn’t happy with the fact that they were running an irrelevant program. They wanted also to be part of the ongoing changes, so they were pretty eager to get into this. One of the skills that we worked very hard on was project management. We wanted to move into project teaching, and this was a way to get a lot of teachers exposed to project-based learning. The second thing we did, by getting them involved in these cross-functional teams, was to begin to break down the isolation that had existed. There were teachers and parents and administrators on these committees, working hard to figure out if there are better ways to do things. It was really a helpful process and did a lot to shift the focus to: Does this work add value to what you need to do in the schools? So, that mantra became very strong. Because we didn’t have the resident skills in-house, we went to the business community and asked for a couple of loaned executives, people who really knew project management, who really understood business support services. We got two loaned executives for a year and a half; it was just wonderful. And it was a way for the business community to connect directly into the schools, so they began to have some, not just buy-in, but ownership of what was happening. Because another theory, another trend, another goal was to create community ownership of the school system and the schools again. When you asked citizens, “Who owns these schools?” they thought it was either the teachers or the principals. And that was not helpful because we were not getting the kind of citizen/parent input into the schools that we needed. Through this core review we captured $8 million. We laid off 250 central administrators in the first year, and put the $8 million into a weighted student formula, based on student learning needs, and sent the money to the schools and said, “You decide.” This was another major step forward, providing a good chance to move the decision making down as close to the delivery point as possible. People were not too engaged in site; we had a lot of site-based decision making rhetoric around, but until we actually put money to it, engagement really wasn’t very significant. When we put money to it and they had a chance to decide, the reaction was, “Wow, we’re going to get a chunk of money here! What should we do with this?” We had people calling us saying, “Can we really decide? Is it okay for us to decide?” That was another major gain that came out of that whole effort. The next year, out came another $8 million, laying off another 150 people. So, the central administration got pared down from 14% to about 5% of the total budget. And I don’t think any central administration should be more than 5% of the total budget. About that time, four board members got together and said, “The superintendent’s gone”. He wasn’t a bad person, but he was not very effective and he was not a very good leader. We went on a joint hunt between the union and management for a superintendent. We laid out the criteria jointly, so we could get somebody who was going to buy into the new directions that we were taking and could provide new, energized leadership for this. We hired John Stanford, a retired general, who brought a new enthusiasm to our district. John’s motto was, Love ’em and lead ’em. This was a person who cared about people deeply, who cared about kids, and who cared about public education. It was exactly the kind of thing that we needed; to have somebody who actually demonstrated that he cared about the employees, cared about the kids. He and I did joint business for the schools, again to show everybody that the union and management are together. There are no two sides to this. John was a great leader and his untimely death was a real loss for us. Early on, John and I discussed how we could create these reforms in a way that they could be sustained. In the 10 years that I was the Executive Director in Seattle, we had had three superintendents, five Chief Academic Officers, and six Chief Financial Officers. In ten high schools, we had 41 principal changes; in ten middle schools, we had 38 principal changes; and in 67 regular elementary schools, we had 158 principal changes. So, to think that you have an administrative structure in place to provide stability over time is just folly. The question was, where we could we put this where it would be stable over time? We decided we would try to create a new contract and put it in the contract. That was great except, of course, we wanted to do some things we weren’t sure the membership was going to be very supportive around. The first thing John and I created was a trust agreement. We said, “This is how we expect people to treat each other. And if you don’t, there will be consequences and recourse.” If teachers and principals at the school setting were not getting along, we provided some mediation. If there was no improvement after a month or so, if they didn’t make changes, they’d be asked to come in and present their case to the superintendent and the head of the union. And we decided. We didn’t want this to go to grievance or arbitration because this was a family issue about how we treat each other. I can’t emphasize enough how important this is in building sustainable labour-management relations. It is about valuing each other and trying to work through problems without going to an outside decision. So, it was a test. In the first two years, John and I removed about 9 principals and twenty teachers who just didn’t get it. That started to get people’s attention. The second thing we did in that agreement was set up a process where the people in the buildings made decisions about what their school plan would look like, based on the data we had generated around their students’ learning needs. Then we gave them the money. We created a weighted student formula and sent 75% of the funding to the schools. In the building, a committee of five teachers and the principal and in some schools parents also engaged directly in this makes decisions about how to spend their budget based on the needs of kids in their school. We did a lot of training with teachers and principals ahead of time so they all understood the intentions and how we expected they would function. This is, again, about creating ownership and responsibility. Next, we turned over vacancies to the building. We said, “You fill your staff vacancies on the basis of qualifications. “We did away with seniority. This was another major step for the union and it was not without some spirited discussion. I think the vote was swayed by several senior teachers who said, “I’ll put my skills and knowledge out there and I think I’ll be able to get any job I want to move toward.” This was passed pretty strongly, and now there is no looking back. We had had lots of abuses with the old system and all kinds of games were being played. Now, there is a real drive to fill positions early with the right people. tough learning needs of kids in these schools. Then we turned our attention to evaluation. We wanted to change teacher evaluation from a gotcha’ to a helpya’. For years we had gone around with a checklist, looking for someone to do something wrong instead of what was going right. So we re-wrote the language, and we also said we would tie student achievement to teachers’ evaluations. Why should we be afraid of that? That’s what we are all about. It was not to be done on a single measure; we used multiple measures. The teacher and the principal had to agree on how they are going to measure student performance. This discussion also made it possible to request any assistance that might be needed to meet those goals. This gave the principals a chance to get engaged again in instruction because many had tracked over solely into administration. This question of administration versus instructional leader is still an ongoing battle. We are beginning to see some major strides in this direction. We also created a professional development program that is site-sensitive, job-embedded and continuous. This means the building examines its staff, what they are trying to do, where the professional development gaps are, and how best to fill those gaps. There are some other things we are doing together. We have a Homework Hotline at the union office manned by teacher volunteers. They have all the textbooks and provide assistance to students who call in. This is especially important for youngsters who don’t have a parent or guardian at home they can turn to for help. We haven’t started this yet, but in Miami, the union has a Montessori primary school in its building. This is a chance for the union to see what it is like running a school and learn from that and try to be helpful. Another thing we worked hard on with the school board was a very active choice program. Parents can choose to have their youngster attend any high school in Seattle. The middle schools are banded, but there is a good wide range of selection. There is a choice of 15 or 20 elementary schools you can send your child to. Opening that up was something that caused some consternation on the part of our members and another thing that came out of that contract. We spent a lot of time on working conditions. We do an annual survey where teachers give feedback on this because we found that to be paramount in terms of helping people be successful. We now have enough data to know that if it is a toxic teaching environment, it is also a toxic learning environment for kids. The two go hand in hand. This is another effort on the part of the union and management, and we both have joint responsibilities to fix it. Sometimes that goes to the Trust Agreement and sometimes there are other things we can do. productivity. We found out that in the high schools 60% of teachers’ time was being spent on things that didn’t add value to student learning. In the middle schools it was 50% and at the elementary level, 40%. This was another avenue for the union and management to work together at changing the learning environment in our schools. Other people are doing some very exciting things. Although everything is contextual, there are a lot of similarities in TURN districts elsewhere. Cincinnati is changing the whole teacher compensation program so they’ll be rewarding people based on skills and knowledge and performance. They spent the first few years redesigning their evaluation process. It is a very rigorous and rich process, where teachers are evaluated ten times over a three-year period, including peer evaluation. Now they are piloting a description of all the responsibilities of teachers in the various areas and the expectations for these responsibilities to be used as the basis of their evaluation. Denver has nine or ten schools moving to a new compensation program. They are in their second or third year of working through that. In Miami, the union has a performance contract with an outside vendor that runs schools. They are running a Montessori school and six others as a private sector business, and if they make money, the teachers will share in the profit. Rochester has a living contract, which means you don’t have to wait until the expiration of the contract to make changes. Rochester also decided to anchor their teacher pay long-term at number three of all surrounding districts. So, they don’t have to bargain salaries any more; they just wait for other districts to settle their contracts. TURN districts are engaged in two other very important projects. Seven locals are working with a research grant from the federal Office of Education Research to re-engineer our unions. They are taking a hard look to see if they are democratic, dynamic and so forth. And, under a grant from the Eli Broad Foundation, some TURN districts are looking at evidence of labor management collaboration that actually ends up improving student learning. These four districts are Rochester, San Francisco, Toledo and Montgomery County, Maryland. We will be adding four more districts to this study next month. We may get answers we don’t like, but we are at least going to find out what union and management can do together to have a positive impact on student learning.